Roofing Superstore is proud to offer a number of PVC roofing sheets, fixings and accessories from the Corolux range. 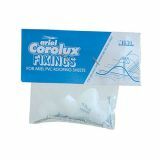 The Corolux range is part of the wide ranging products offered by Ariel Plastics, a market leader in the manufacturing and distribution of roofing and glazing products and accessories. Ariel Plastics are renown for their high quality and innovative solutions for the roofing and construction market, so rest assured that all Corolux products will also be of the highest quality and performance. What are PVC Corolux roofing sheets? 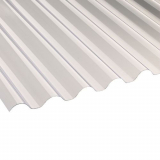 Corolux roofing sheets are roofing sheets manufactured from PVC, with a mini corrugated profile. 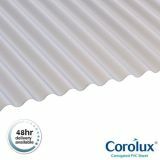 The Corolux range of roof sheets comes in a range of different sizes and thicknesses, from 0.8mm to 1.1mm thicknesses, and a standard profile, a heavy duty profile, a mini profile or a 77/20 profile. Why choose Corolux roof sheets? Corolux roof sheets are covered by a 10 year warranty, providing peace of mind that the product you receive will be durable, functional and long lasting. The warranty means that if your Corolux roof sheet is installed as per the manufacturer’s instructions and fails within 10 years of purchase due to a manufacturing defect, you’ll receive a replacement product free of charge. Corolux roof sheets have been manufactured to create a roofing sheet that is simple to use, meaning DIYers can install it themselves for use on car ports, canopies, gazebos and much more. This means that the installation process is relatively quick and straight forward, and only standard DIY tools are required to cut and drill the roofing sheets. Corolux roofing sheets are able to be installed on roof pitches as low as 5 degrees, meaning they can be used in a wide variety of different roofing applications. As well as providing a sturdy and secure roof, Corolux roofing sheets also allow natural light to flow into the structure below, reducing the amount of artificial required to brighten the room. Corolux roof sheets provide up to three times more light in than a vertical glazing product of the same size. This means that more natural light is let in, reducing the amount of artificial light required and therefore reducing energy bills. Corolux roofing sheets come in both translucent and transparent options. This means that you can opt for more privacy if required, with the translucent sheets, whilst still allowing some light in, or opt for maximum light transmission with clear roof sheets. 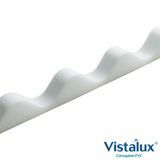 Additionally choose from standard profile Corolux roof sheets, mini profile Corolux sheets for smaller projects, or heavy duty profile sheets for larger scale projects. When you receive your Corolux roof sheets, keep them stored indoors on a flat and dry surface, in a cool area. 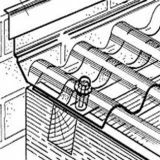 If you are unable to keep your roof sheets indoors, store them outdoors on wooden bearers, and cover with an opaque light coloured tarpaulin – if left uncovered they will distort due to solar heat gain. Still got questions about Corolux roof sheets or whether they are suitable for your latest project? Give our team a call and they will be more than happy to help – 01752 692760. Alternatively use the live chat in the bottom right hand corner!